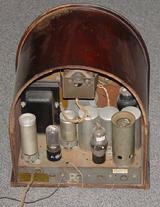 This Philco Model 80 gem was found in the archives of K6GLH near Jackson, California. When restoring an antique collectable, my first desire is to put a nice look on the cabinet. That is the inspiration for the electical work ahead. 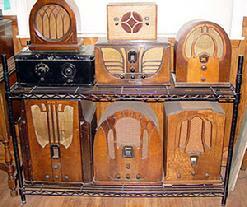 Below, you will see the radio in its former home and displaying up close cabinet shots. A new "price leader" set, this little four-tube regenerative superheterodyne does not work as well as its larger cousins. 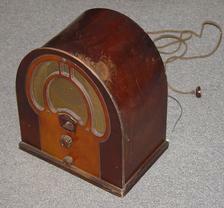 This radio was intended to get people into the showrooms, where it was the job of the salesmen to sell a customer "up" to a higher-priced model. As 1932 was the worst year of the depression, however, the strategy backfired on Philco - and Model 80B became a runaway success. Left: Cabinet after a face lift. While the front was left in tact, the top/sides and bottom rails were refinished. Spray sanding sealer was used for the finish coat. Right: Chassis underneath before any restoration. 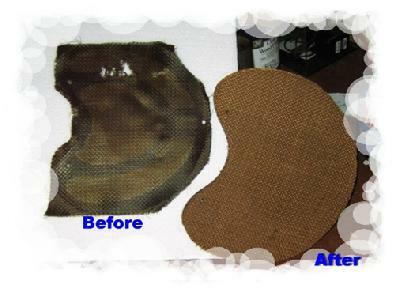 Before and after shots of the speaker grill cloth on the Philco Model 80. 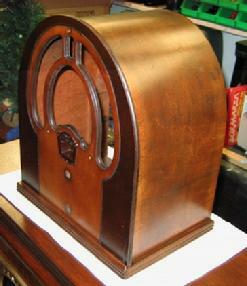 For a mere $7, you can make your restored radio look like it did the day it rolled down the assembly line. See the "Cool Links" page for this speaker grill cloth. How to affix the cloth? I used spray adhesive. It won't soak through and it bonds well. Apply the adhesive to the cloth, not the wood. Use a (NEW) single edge razor blade to trim the edge. All new capacitors and resistors, one new tube, new grill cloth, a little adjusting and lots of general cosmetic clean-up. This little radio's bark is much louder than its bite. Great reception and audio quality. This is its new home. Enjoy this recording of Jack Benny's First Professional Performance, sponsored by Canada Dry. 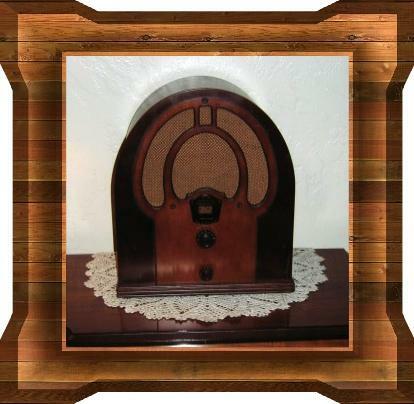 This program aired May 2, 1932, the same year this Philco was sold. Scroll up to the BIG radio picture as you listen.